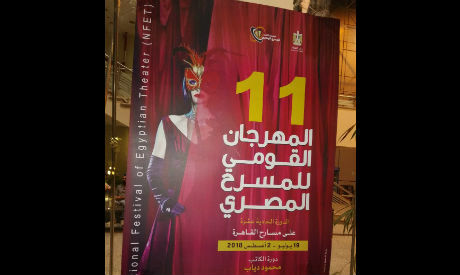 The 11th edition of the National Theatre Festival was inaugurated on Thursday by Culture Minister Ines Abdel-Dayem at Cairo Opera House. The festival will run until 2 August, with events at 13 different theatres. Thirty-seven plays that will be performed over the course of the festival. Entrance is free. This year’s festival bears the name of playwright Mahmoud Diab, one of the most influential Egyptian playwrights of the 20th century. His plays are still performed in various venues such as the Youth Theatre and in culture ministry venues. The festival’s opening ceremony included a dance performance of his famous play A Land That Doesn’t Grow Flowers. A documentary film, Truth Seeker, about his life was screened afterwards. The documentary showed excerpts from his most influential plays of the 1960s, 70s and 80s, such as The Old House, A Good Man in Three Stories, Harvest Nights and The Whirlwind. As is tradition now at the festival, theatre pioneers were honoured for their achievements. Director Galal El-Sharqawy, playwright Mohamed Abo El-Ela El-Salamoni, director Hussein Abdel-Kader, actress Samira Mohsen, scenographer Hussein El-Ezaby and the late critic Mohamed El-Refai were honoured for their work and contribution. This year’s prizes are worth EGP 375,000 in total, split among the festival’s 19 official competitions. Sudan is the guest of honour at the festival and the Sudanese National Theatre company will perform the play Ketmet at the National Theatre on 30 July.